Isshin is a small restaurant tucked away in the heart of the Gion district in Kyoto. 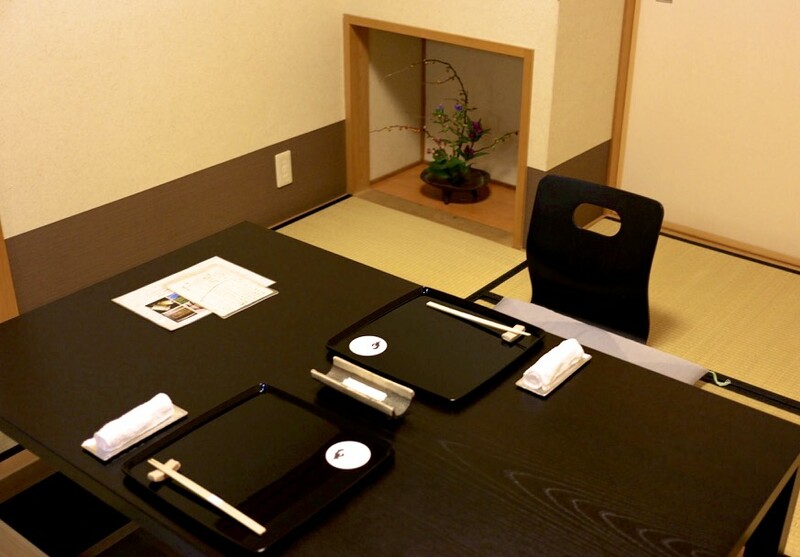 It is operated by Chef Hideichi Katagiri and his wife, who looks after the front of house. 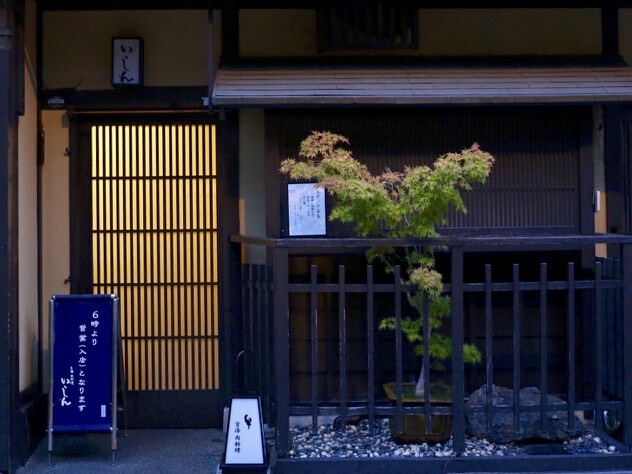 The couple moved their restaurant to Kyoto in 2003 from the Shiga prefecture, bringing with them the region’s famous Ōmi beef. Isshin is famous amongst the locals for their dishes utilising the rarest cut of the inner shoulder blade, the misuji, which only yields about 2kg from an entire cow. The restaurant, of course, offers much more than that. 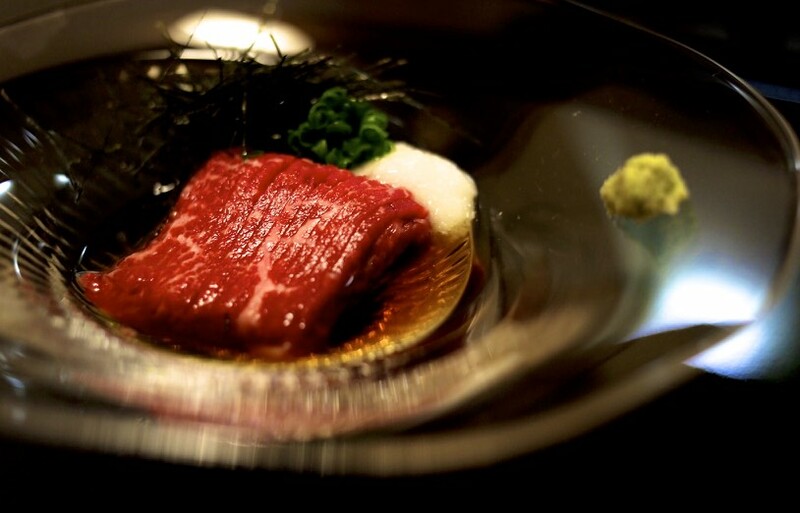 Isshin offered a very good value nose-to-tail menu of Ōmi beef for 13,000 yen. I was excited to compare this against the Matsuzaka beef I had tried in Tokyo! Isshin has a couple of policies around dining manners. Whilst the chef doesn’t mind photographs being taken, he does ask for diners not to use cameras that make a lot of noise. He also doesn’t take solo diners as they tend to finish their dishes quicker and disrupt his serving rhythm. I booked one of their two private dining rooms to ensure we could have the option of using a more powerful DSLR. It was a good option given the low lighting level throughout the restaurant. Service commenced rather smoothly. Our drinks were brought to us promptly… although it must be noted that was not consistent throughout the meal. 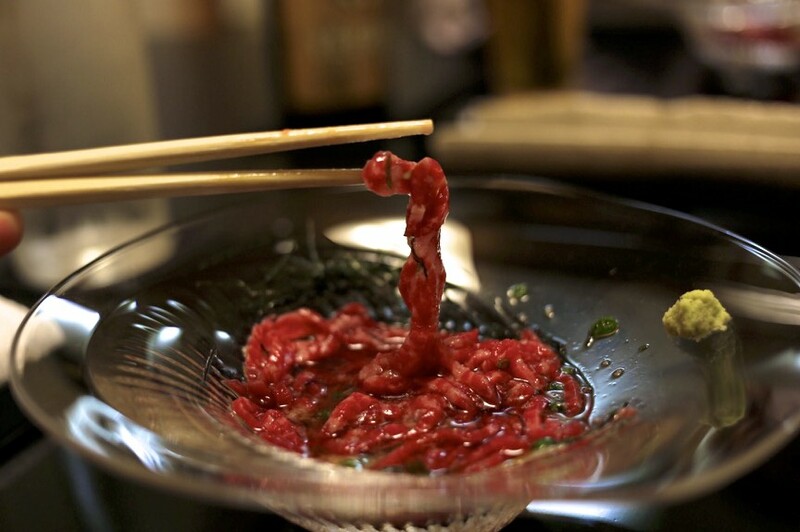 1st Course: Beef Sōmen (生肉そうめん) – Raw beef that had been cut very precisely to resemble the Japanese wheat flour noodle of sōmen. 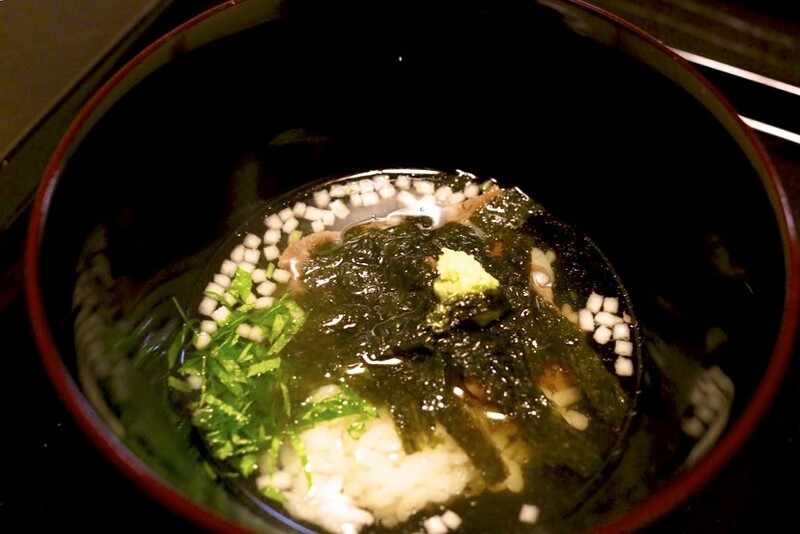 It was served with yam, seaweed, spring onion, horse radish, wasabi and home made tsuyu dipping sauce. The thin beef noodle had a good amount of marbling with just the right amount of fat; not too little and not too much. The wasabi and horse radish cut through the fattiness of the beef and drew out its flavour. It had a lovely smooth texture and was a great introduction to Ōmi beef. 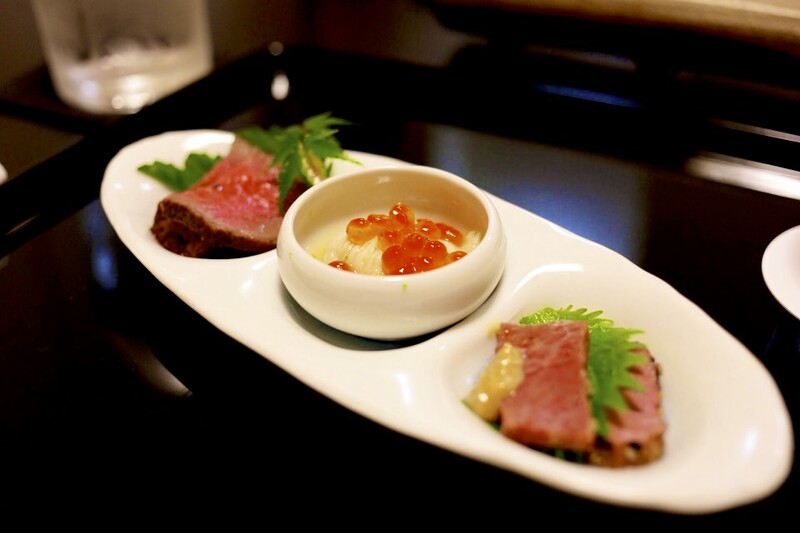 2nd Course: Beef Three Ways (生肉３種) – Starting with the left was a vacuum cooked Roast beef, followed by a Raw yuba (tofu skin) made with beef and Mino (a fish which is the South Korean varietal of the Japanese Drumfish), topped with salmon roe. The last item to the right were two slices of Inner Thigh prepared two ways; one as a shiozuke (in salt), and one in misozuke (in miso). 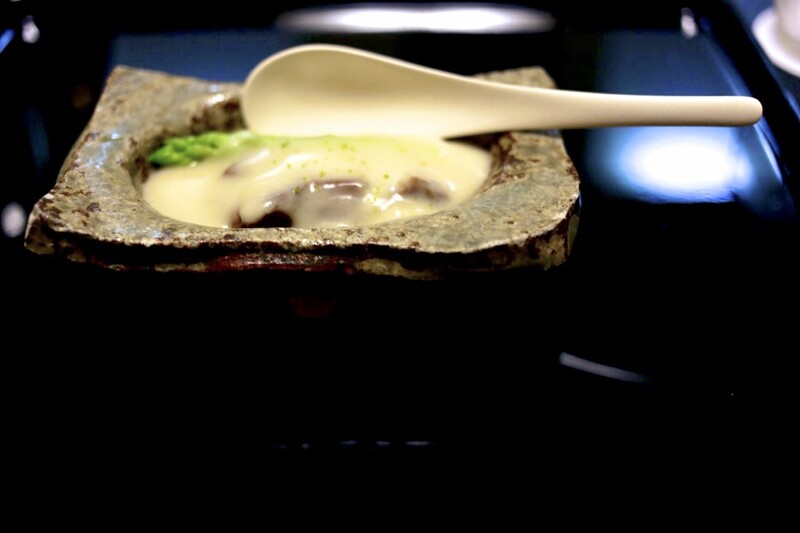 3rd Course: Beef tongue and Conger eel soup (生タンと穴子しんじょうのお椀) – The chef carefully placed the beef tongue on the conger eel so that it sat above the soup, ensuring it did not cook any more than it needed to. Sure enough, the tongue was cooked beautifully and, whilst it was slightly tougher in texture, the flavour was amazing. The conger eel and broth were subtle but present, allowing the star of the dish to shine. 4th Course: Inner shoulder blade of beef (ミスジの昆布締め) – This was exactly what I had been waiting for. The premium cut of the beef. The inner shoulder blade, the misuji, which only yields 2kg from an entire cow is hightly sought after. 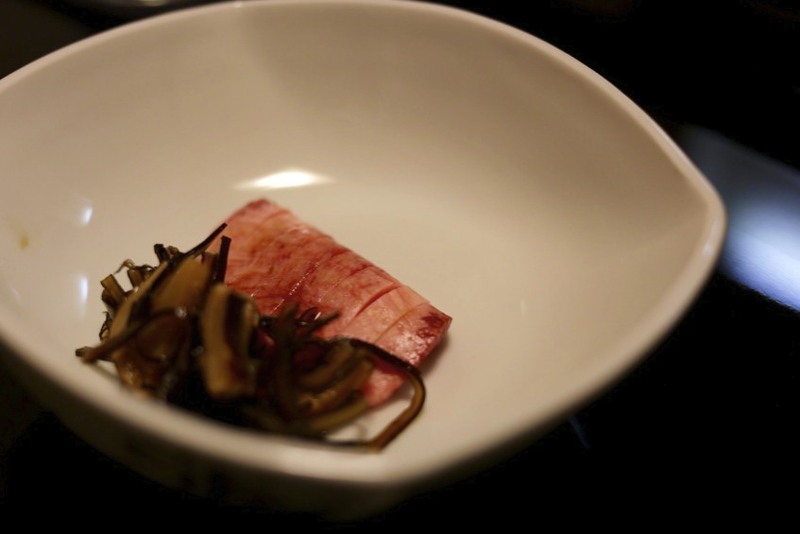 It was cured with kelp to draw the flavour out of the meat using its natural umami. It was served with Japanese aubergine (nama nasu) and radish, dressed with a ponzu sauce. It just melted like butter in my mouth. Wow. 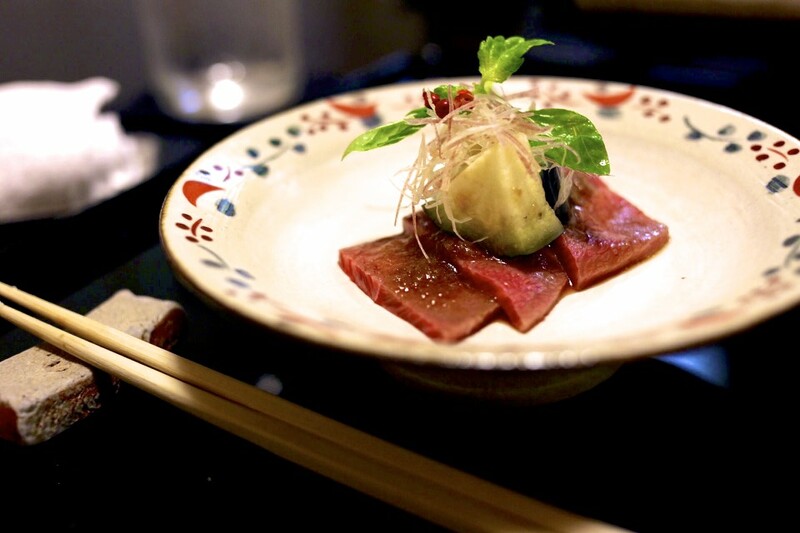 5th Course: Beef tongue sashimi (タン刺し) – The beef had been marinated in soy sauce before it was served with some kelp (konbu) to enhance the flavour. This was another solid dish oozing with umami. 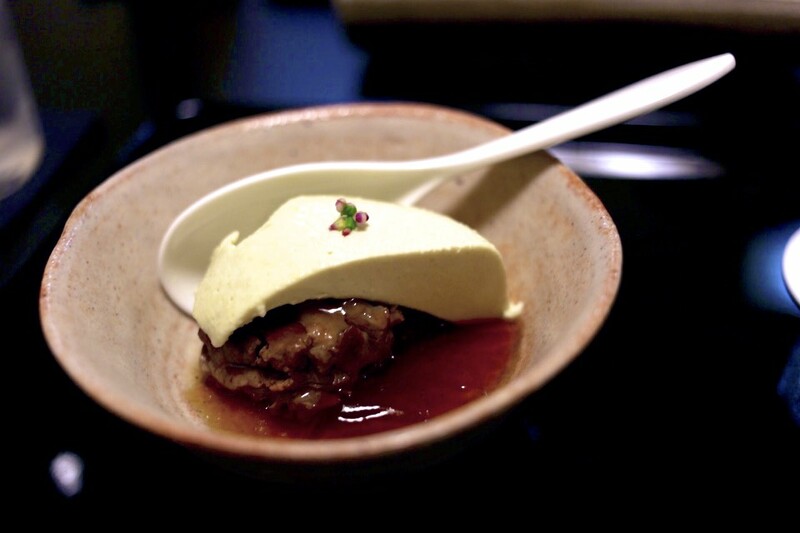 6th Course: Beef Tail with Dadacha-mame flan (ダダ茶豆のフランとテール肉の煮凝り) – This was tail meat that had been slow cooked over hours to soften the texture. The gelatinous feel of the sauce was extremely rich. 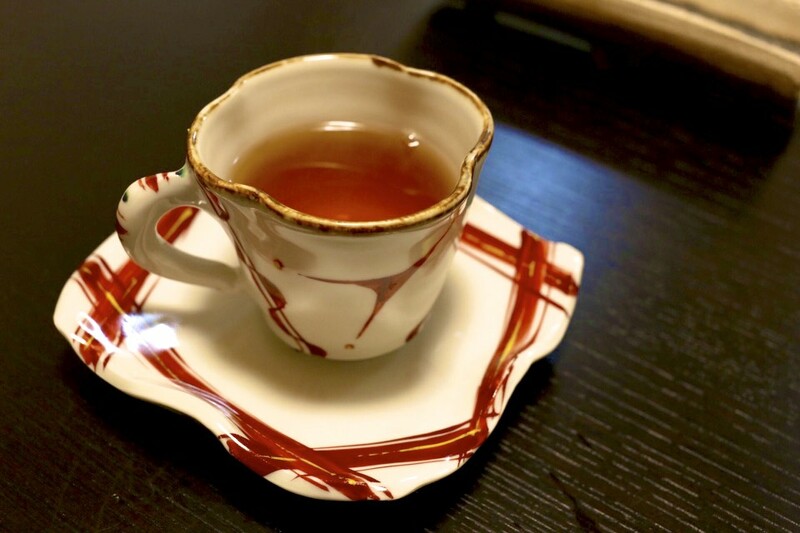 This balanced well with the flan made from dadacha-mame. Dadacha-mame is considered to be the king of edamame’s with its earthy and sweet flavours. 7th Course: Sushi moriawase (寿司の盛り合わせ) – Starting with the right was Aburi Toro (あぶり寿司) which was essentially another beautiful slice of their superior misuji cut that had been torched to create a nice and oily sushi. 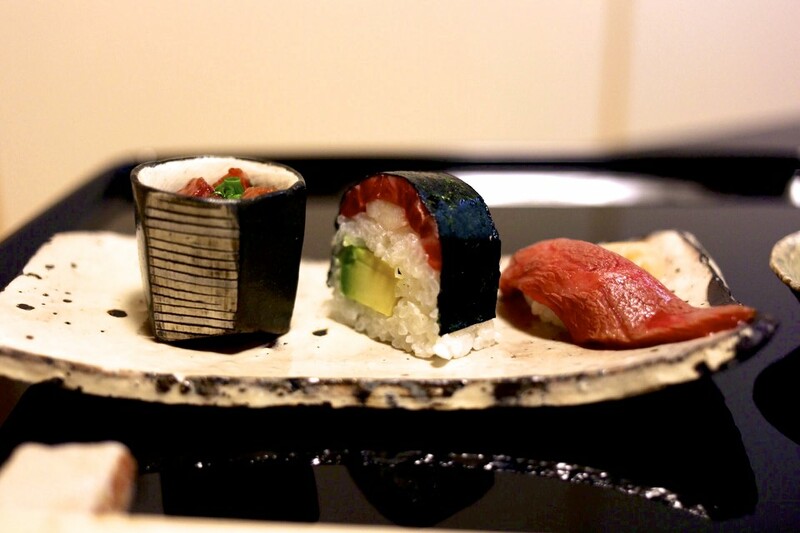 In the middle however, was a rather confused Crab and Avocado roll (カニアボカド巻) with slithers of the same cut of beef. It wasn’t terrible with the creamy avocado and rich crab meat but I thought it just didn’t fit and distracted from the rest of the dish. Lastly to the left was the ‘Toro’ Beef on rice (トロ肉漬けごはん) which was a bowl of fatty beef that had been pickled over the rice to further infuse its flavour. The texture was exactly like a top grade ootoro and just melted in your mouth. I never expected to have this texture from beef. It was even softer than the finest fassone tartare I had in Piedmont. 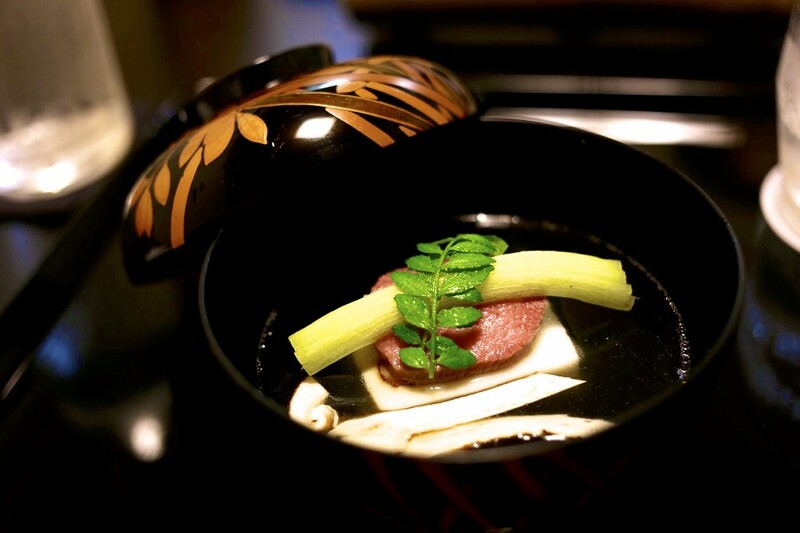 8th Course: Asparagus and beef tongue in white miso (アスパラガスとタンの白味噌仕立て) – The lovely cut of misuji was served this time as a stew with sweet white miso. It wasn’t a terrible dish but the white miso distracted from the beautiful cut of meat which was a shame. 9th Course: Sirloin steak (牛肉ステーキ) – As expected from a restaurant specialising in beef, the penultimate course was a fine miniature sirloin steak, dressed with a soy sauce foam and horse radish, served with a side of salad. The soy sauce foam was like no other. It was light and airy, tangling around the meat and melted on your tongue. The meat of course was cooked to perfection, bordering the rarer side to medium-rare with a slight crispy exterior. 10th Course: Beef Chazuke (肉茶漬け) – The finale was a comforting ‘porridge’ or chazuke of beef served with a side of pickles. 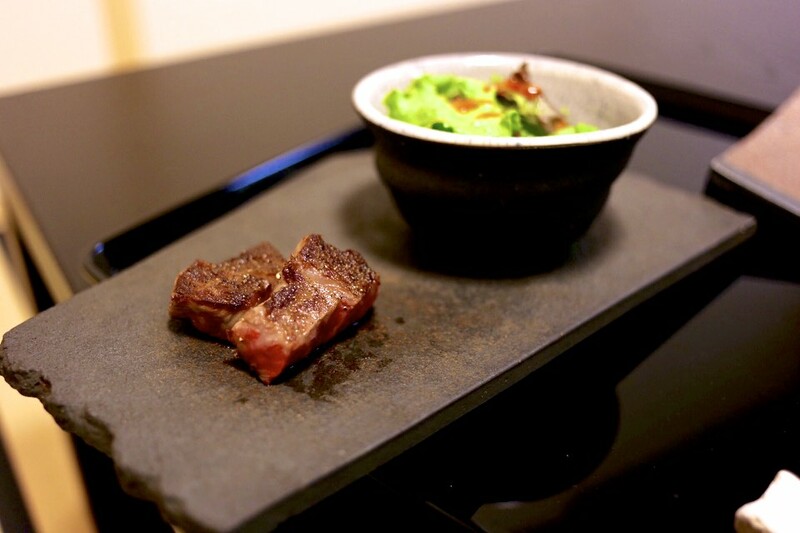 The pieces of beef was prepared rather unconventionally as a nikujaga (beef cooked in a soy, mirin, sake and brown sugar) before being added into the green tea with puffed rice, seaweed and spring onion. 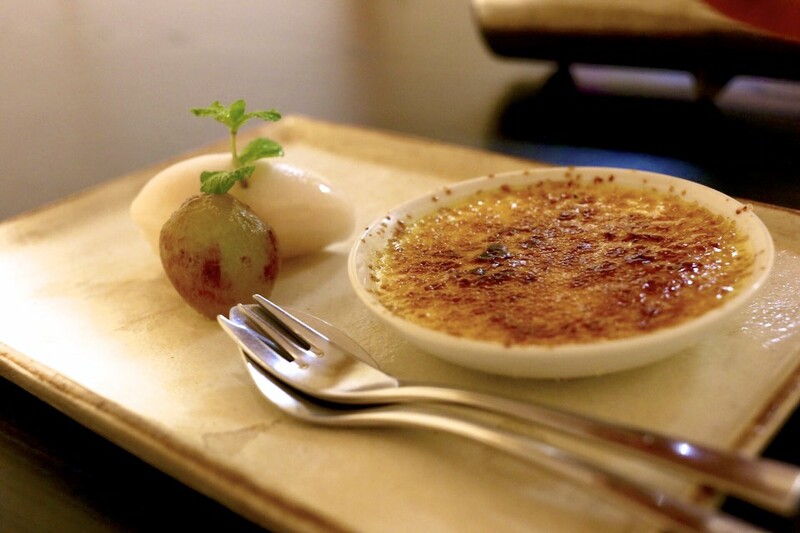 11th Course: Corn crème brûlée and peach sorbet – A rather bizarre combination of flavours to finish of the meal. On their own each element was delicious and would have probably worked better as separate dishes. Needless to say, 13,000 yen for the entire menu was an absolute bargain and a steal given the quality of the dishes that kept being brought to us. I personally found the marbling of the beef here far more agreeable than the fattier Matsuzaka beef I had up in Tokyo at Satou Steakhouse. The misuji cut was particularly impressive and unlike anything I have tried before. The downside to the meal was the service tempo which almost gradually came to a near grinding stop when the restaurant was operating at full capacity. It took nearly an hour before someone came to our room after our last course had been served. Luckily we were in no rush to go anywhere but let it be warned that you may want to avoid planning ahead for any post-dinner activities. This entry was posted in Japan and tagged Gion, Isshin, Japan, Katagiri, Kyoto, Misuji, Omi beef, Satou Steakhouse on June 16, 2016 by admin.